Student loan debt is a major problem facing today’s graduates. Statistics show that over 70% of college students are graduating with more than $30,000 in student loan debt. This burden greatly impacts these millennials in life decisions; it often causes them to delay both buying a home and committing to marriage. Many of them chose to attend college (knowing their parents couldn’t afford it) because they considered it a worthwhile investment in their future earning potential. However, they probably didn’t fully realize what it would mean for them come graduation, as the first job does not always appear how (or when) they imagined it would. Kristina Ellis is the perfect example of a student who could not rely on parental financing. In fact, she tells the story of when her mother, widowed by cancer, explained that to her on her first day of high school. She informed her daughter that, after high school graduation, she would be on her own financially. She knew that it was difficult enough for her to get by day-to-day with two children, and helping them through college would not be an option. You can imagine how difficult it must have been for Kristina to hear this at that age. However, as she explains, the advance notice allowed her to begin planning early, and was thereby the key to her success in earning the $500,000 in scholarship money that completely covered her college and graduate school education. Ellis wrote her first book, “Confessions of a Scholarship Winner,” mainly focusing on her personal story and method of paying for college: earning scholarships. 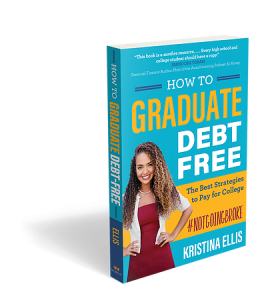 In her new book, “How to Graduate Debt-Free: The Best Strategies to Pay for College,” she explores other strategies of how students can pay for college without falling back on student loans and ending up with too much debt. The book includes pointers that can be implemented at various stages. 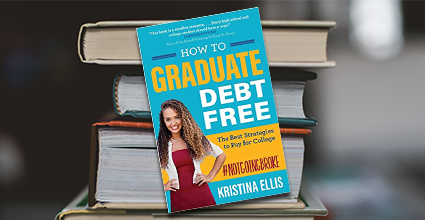 From suggestions for high school-age students planning ahead to advice on working a job during college, anyone looking for a way to graduate without debt will find the book valuable.